This main-course salad makes an ideal kitchen supper and it’s easy to vary the ingredients as you choose – using different salad leaves, replacing the black pudding with British chorizo or making a parsley-based dressing would all work well. For the dressing, shake all the ingredients in a jar; leave to infuse for an hour. Boil the eggs in simmering water for 3 minutes, then refresh in cold water and peel. Divide the sausage meat into 4 patties and wrap evenly around each egg. Put the breadcrumbs, flour and beaten egg in 3 separate containers. Coat each Scotch egg in flour, then egg, then crumbs. Heat the oil to 140–150°C in a deep, heavy-based pan. Fry the eggs for 3–4 minutes and drain on kitchen paper. 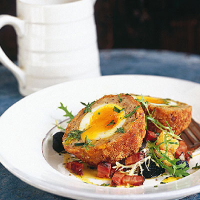 Cook the lardons and black pudding in 1 tbsp oil in a frying pan for 2–3 minutes. Remove. Heat the remaining oil, add the bread with the butter and fry for 4 minutes. Drain on kitchen paper. Toss the leaves with a little strained dressing; season and arrange with the croutons and cooked meat. Top with the halved Scotch eggs, and more dressing. You can’t beat a great English ale with this earthy salad.